Using the Subaru Telescope, researchers at the Special Astrophysical Observatory in Russia and Kyoto University in Japan have found evidence that enigmatic objects in nearby galaxies - called ultra-luminous X-ray sources (ULXs) - exhibit strong outflows that are created as matter falls onto their black holes at unexpectedly high rates. The strong outflows suggest that the black holes in these ULXs must be much smaller than expected. Curiously, these objects appear to be "cousins" of SS 433, one of the most exotic objects in our own Milky Way Galaxy. 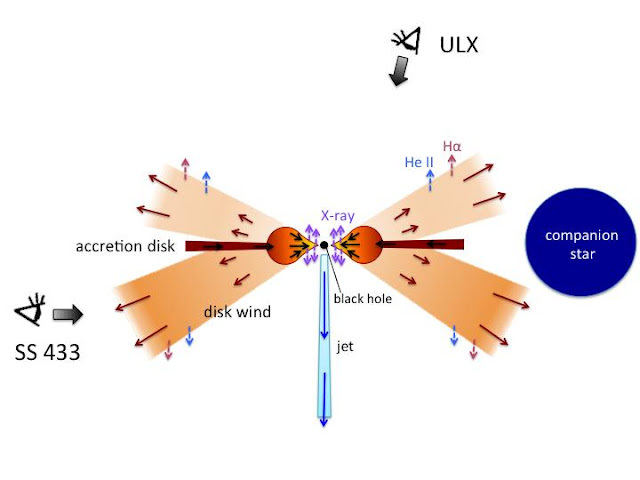 The team's observations help shed light on the nature of ULXs, and impact our understanding of how supermassive black holes in galactic centers are formed and how matter rapidly falls onto those black holes. Multi-color optical image around the ULX "X-1" (indicated by the arrow) in the dwarf galaxy Holmberg II, is located in the direction of the constellation Ursa Major, at a distance of 11 million light-years. The image size corresponds to 1,100 × 900 light-years at the galaxy. The red color represents spectral line emission from hydrogen atoms. X-ray observations of nearby galaxies have revealed these exceptionally luminous sources at off-nuclear positions that radiate about million times higher power than the Sun. The origins of ULXs have been a subject of heated debate for a long time. The basic idea is that a ULX is a close binary system consisting of a black hole and a star. As matter from the star falls onto the black hole, an accretion disk forms around the black hole. As the gravitational energy of the material is released, the innermost part of the disk is heated up to a temperature higher than 10 million degrees, which causes it to emit strong X-rays. The unsolved key question about these objects asks: what is the mass of the black hole in these bright objects? ULXs are typically more than a hundred times more luminous than known black hole binaries in the Milky Way, whose black hole masses are at most 20 times the mass of the Sun. This is a schematic view of ULXs (looking from upper side) and SS 433 (looking from left side). Strong X-rays are emitted from the inner region of the supercritical accretion disk. Powerful winds are launched from the disk, which eventually emit spectral lines of helium ions and hydrogen atoms. There are two different black hole scenarios proposed to explain these objects: (1) they contain very "big" black holes that could be more than a thousand times more massive than the Sun (Note 1), or (2) they are relatively small black holes, "little monsters" with masses no more than a hundred times that of the Sun, that shine at luminosities exceeding theoretical limits for standard accretion (called "supercritical (or super-Eddington) accretion," Note 2). Such supercritical accretion is expected to produce powerful outflow in a form of a dense disk wind. To understand which scenario explains the observed ULXs researchers observed four objects: Holmberg II X-1, Holmberg IX X-1, NGC 4559 X-7, NGC 5204 X-1, and took high-quality spectra with the FOCAS instrument on Subaru Telescope for four nights. Image 1 shows an optical multi-color image toward Holmberg II X-1 as observed with Hubble Space Telescope. The object X-1, indicated by the arrow, is surrounded by a nebula (colored in red), which is most likely the gas heated by strong radiation from the ULX. The team discovered a prominent feature in the optical spectra of all the ULXs observed. It is a broad emission line from helium ions, which indicates the presence of gas heated to temperatures of several tens of thousands of degrees in the system. In addition, they found that the width of the hydrogen line, which is emitted from cooler gas (with a temperature of about 10,000 K), is broader than the helium line. The width of a spectral line reflects velocity dispersion of the gas and shows up due to the Doppler effect caused by a distribution of the velocities of gas molecules. These findings suggest that the gas must be accelerated outward as a wind from either the disk or the companion star and that it is cooling down as it escapes. The activity of these ULXs in distant galaxies is very similar to a mysterious object in our own Milky Way. The team noticed that the same line features are also observed at SS 433, a close binary consisting of an A-type star and most probably a black hole with a mass less than 10 times that of the Sun. SS 433 is famous for its persistent jets with a velocity of 0.26 times the speed of light. It is the only confirmed system that shows supercritical accretion (that is, an excessive amount of accretion that results in a very powerful outflow). By contrast, such features have not been observed from "normal" black hole X-ray binaries in the Milky Way where sub-critical accretion takes place. After carefully examining several possibilities, the team concluded that huge amounts of gas are rapidly falling onto "little monster" black holes in each of these ULXs, which produces a dense disk wind flowing away from the supercritical accretion disk. They suggest that "bona-fide" ULXs with luminosities of about million times that of the Sun must belong to a homogeneous class of objects, and SS 433 is an extreme case of the same population. In these, even though the black hole is small, very luminous X-ray radiation is emitted as the surrounding gas falls onto the disk at a huge rate. Image 3 is a schematic view of the ULXs (upper side) and SS 433 (lower side). If the system is observed from a vertical direction, it's clear that the central part of the accretion disk emits intense X-rays. If SS 433 were observed in the same direction, it would be recognized as the brightest X-ray source in the Milky Way. In reality, since we are looking at SS 433 almost along the disk plane, our line-of-sight view towards the inner disk is blocked by the outer disk. The accretion rate is inferred to be much larger in SS 433 than in the ULXs, which could explain the presence of persistent jets in SS 433. Such "supercritical accretion" is thought to be a possible mechanism in the formation of supermassive black holes at galactic centers in very short time periods (which are observed very early in cosmic time). The discovery of these phenomena in the nearby universe has significant impacts on our understanding of how supermassive black holes are formed and how matter rapidly falls onto them. There are still some remaining questions: What are the typical mass ranges of the black holes in ULXs? In what conditions can steady baryonic jets as observed in SS 433 be produced? Dr. Yoshihiro Ueda, a core member of the team, expresses his enthusiasm for future research in this area. "We would like to tackle these unresolved problems by using the new X-ray observations by ASTRO-H, planned to be launched early next year, and by more sensitive future X-ray satellites, together with multi-wavelength observations of ULXs and SS 433," he said. This work has been published online in Nature Physics on 2015 June 1 (Fabrika et al. 2015, "Supercritical Accretion Discs in Ultraluminous X-ray Sources and SS 433", 10.1038/nphys3348). The research was supported by the Japan Society for the Promotion of Science's KAKENHI Grant number 26400228. 1. Generally, black holes with masses between about 100 and about 100,000 times that of the Sun are called "intermediate-mass black holes," although there is no strict definition for the mass range. 2. In a spherically symmetric case, matter cannot fall onto a central object when the radiation pressure exceeds the gravity. This luminosity is called the Eddington limit, which is proportional to the mass of the central object. When matter is accreted at rates higher than that corresponding to the Eddington limit, it is called "supercritical (or super-Eddington) accretion." In the case of non-spherical geometry, such as disk accretion, supercritical accretion may happen. Type Ia supernovae are the "standard candles" astrophysicists use to chart distance in the Universe. But are these dazzling exploding stars truly all the same? To answer this, scientists must first understand what causes stars to explode and become supernovae. Supernova 3C58, first observed in the year 1181 AD by Chinese and Japanese astronomers, was imaged by the Chandra telescope in X-ray emissions. Recently, a unique collaborative project between the California Institute of Technology (Caltech) and the Weizmann Institute of Science provided a rare glimpse of the process. Their findings were published in Nature. The project, called the Palomar Transient Factory, is a robotic telescope system based in Southern California that scans the night sky for changes. 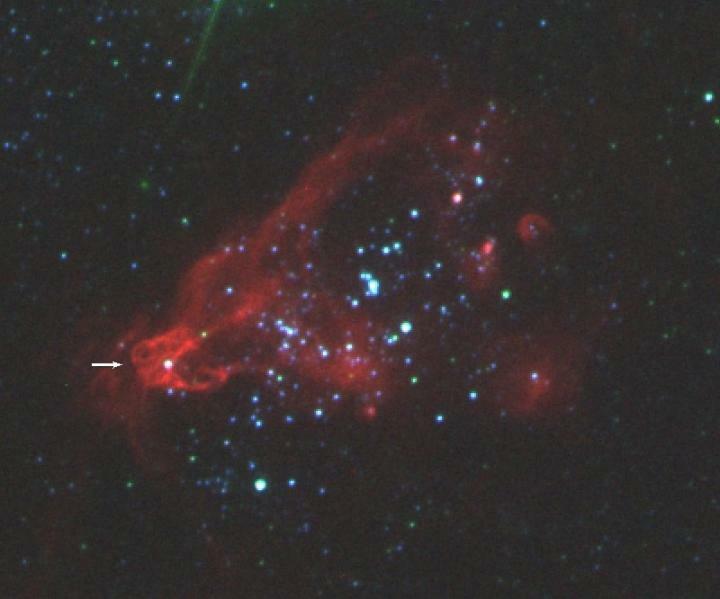 In May, halfway around the world at the Weizmann Institute, Dr. Ilan Sagiv realized that one of the bright new lights the Palomar telescope had pinpointed was, indeed, a supernova - just four days into the explosion - and he sounded the alert sending the Swift Space Telescope on NASA's Swift Satellite to observe the blast. But the Swift Telescope also observed in an unusual way - in the invisible, ultraviolet range. "Ultraviolet is crucial," says the Weizmann Institute's Prof. Avishay Gal-Yam of the Particle Physics and Astrophysics Department, "because initially, supernova blasts are so energetic that the most important information can only be gathered in short wavelengths. And it can only be seen from a space telescope, because the ultraviolet wavelengths are filtered out in the Earth's atmosphere." The researchers collected observations ranging from the energetic X-ray and UV all the way to the radio wavelengths, the latter effort led by the Institute's Dr. Assaf Horesh. Caltech graduate student Yi Cao, who was the lead author on the paper, and his advisor Prof. S. Kulkarni, compared the figures from the observations to various models to see which fit. Astrophysicists mostly agree that the exploding stars that become type Ia supernova are extremely dense, old stars called white dwarfs. But a number of models have been proposed to explain what makes them suddenly blow up. Ultraviolet observation enabled the researchers to see something they had never seen before: a unique, brief spike in the high-energy radiation very early on. This spike, says Gal-Yam, fits a model in which a dwarf star has a giant companion. "The white dwarf is the mass of the Sun packed into a sphere the size of the Earth, while its companion is around 50-100 times bigger around than the Sun." Material flows from the diffuse star to the dense one until, at some point the pressure from the added mass causes the smaller star to detonate. The radiation spike is caused by the initial material thrown off in the blast slamming into the companion. Gal-Yam says that the group's findings show, among other things, the importance of ultraviolet-range observations. He is hopeful that the ULTRASAT mini-satellite planned by the Weizmann Institute's Prof. Eli Waxman, together with other researchers, the Israeli Space Agency and NASA, which will observe in the ultraviolet range, will help researchers discover whether this explosive process is common to type Ia supernovae. Americans spend over $10 billion a year on products and surgery in their quest to find a "fountain of youth," with little permanent success. Botulinum toxin -- notably Botox -- which smoothes lines and wrinkles to rejuvenate the aging face has been the number one nonsurgical procedure in the U.S. since 2000. But injections of this toxic bacterium are only a temporary solution and carry many risks, some neurological. A team of Tel Aviv University (TAU) and Harvard Medical School researchers has now devised a non-invasive technique that harnesses pulsed electric fields to generate new skin tissue growth. According to their research, the novel non-invasive tissue stimulation technique, utilizing microsecond-pulsed, high-voltage, non-thermal electric fields, produces scarless skin rejuvenation and may revolutionize the treatment of degenerative skin diseases. The study, published recently in Scientific Reports, was led by Dr. Alexander Golberg of TAU's Porter School of Environmental Studies and the Center for Engineering in Medicine at Massachusetts General Hospital, Harvard Medical School, and Shriners Burns Hospital in Boston, in collaboration with Dr. William J. Austen, Jr. from the Department of Plastic Surgery at Massachusetts General Hospital and Dr. Martin L. Yarmush at the Center for Engineering in Medicine at Massachusetts General Hospital, Harvard Medical School, and Shriners Burns Hospital in Boston, along with other prominent researchers. "Pulsed electrical field technology has many advantages, which have already proved effective -- for example, in food preservation, tumor removal, and wound disinfection," said Dr. Golberg. "Our new application may jumpstart the secretion of new collagen and capillaries in problematic skin areas. Considering that, in the modern era of aging populations and climate change, degenerative skin diseases affect one in three adults over the age of 60, this has the potential to be an healthcare game changer." Current therapies to rejuvenate skin use various physical and chemical methods to affect cells and the extracellular matrix, but they induce unsightly scarring. Pulsed electric fields, however, affect only the cell membrane itself, preserving the extracellular matrix architecture and releasing multiple growth factors to spark new cell and tissue growth. By inducing nanoscale defects on the cell membranes, electric fields cause the death of a small number of cells in affected areas. The released growth factors increase the metabolism of the remaining cells, generating new tissue. "We have identified in rats the specific pulsed electric field parameters that lead to prominent proliferation of the epidermis, formation of microvasculature, and secretion of new collagen at treated areas without scarring," said Dr. Golberg. "Our results suggest that pulsed electric fields can improve skin function and potentially serve as a novel non-invasive skin therapy for multiple degenerative skin diseases." The researchers are currently developing a low-cost device for use in clinical trials in order to test the safety and efficacy of the technology in humans. On June 15, NASA's Swift caught the onset of a rare X-ray outburst from a stellar-mass black hole in the binary system V404 Cygni. Astronomers around the world are watching the event. In this system, a stream of gas from a star much like the sun flows toward a 10 solar mass black hole. Instead of spiraling toward the black hole, the gas accumulates in an accretion disk around it. Every couple of decades, the disk switches into a state that sends the gas rushing inward, starting a new outburst. The outburst came from V404 Cygni, a binary system located about 8,000 light-years away that contains a black hole. Every couple of decades the black hole fires up in an outburst of high-energy light, becoming an X-ray nova. Until the Swift detection, it had been slumbering since 1989. An X-ray nova is a bright, short-lived X-ray source that reaches peak intensity in a few days and then fades out over a period of weeks or months. The outburst occurs when stored gas abruptly rushes toward a neutron star or black hole. By studying the patterns of the X-rays produced, astronomers can determine the kind of object at the heart of the eruption. "Relative to the lifetime of space observatories, these black hole eruptions are quite rare," said Neil Gehrels, Swift's principal investigator at NASA's Goddard Space Flight Center in Greenbelt, Maryland. "So when we see one of them flare up, we try to throw everything we have at it, monitoring across the spectrum, from radio waves to gamma rays." Astronomers classify this type of system as a low-mass X-ray binary. In V404 Cygni, a star slightly smaller than the sun orbits a black hole 10 times its mass in only 6.5 days. The close orbit and strong gravity of the black hole produce tidal forces that pull a stream of gas from its partner. The gas travels to a storage disk around the black hole and heats up to millions of degrees, producing a steady stream of X-rays as it falls inward. But the disk flips between two dramatically different conditions. In its cooler state, the gas resists inward flow and just collects in the outer part of the disk like water behind a dam. Inevitably the build-up of gas overwhelms the dam, and a tsunami of hot bright gas rushes toward the black hole. Astronomers relish the opportunity to collect simultaneous multiwavelength data on black hole binaries, especially one as close as V404 Cygni. In 1938 and 1956, astronomers caught V404 Cygni undergoing outbursts in visible light. During its eruption in 1989, the system was observed by Ginga, an X-ray satellite operated by Japan, and instruments aboard Russia's Mir space station. "Right now, V404 Cygni shows exceptional variation at all wavelengths, offering us a rare chance to add to this unique data set," said Eleonora Troja, a Swift team member at Goddard. Ongoing or planned satellite observations of the outburst involve NASA's Swift satellite, Chandra X-ray Observatory and Fermi Gamma-ray Space Telescope, as well as Japan's MAXI, the European Space Agency's INTEGRAL satellite, and the Italian Space Agency's AGILE gamma-ray mission. Ground-based facilities following the eruption include the 10.4-meter Gran Telescopio Canarias operated by Spain in the Canary Islands, the University of Leicester's 0.5-meter telescope in Oadby, U.K., the Nasu radio telescope at Waseda University in Japan, and amateur observatories. V404 Cygni has flared many times since the eruption began, with activity ranging from minutes to hours. "It repeatedly becomes the brightest object in the X-ray sky -- up to 50 times brighter than the Crab Nebula, which is normally one of the brightest sources," said Erik Kuulkers, the INTEGRAL project scientist at ESA's European Space Astronomy Centre in Madrid. "It is definitely a 'once in a professional lifetime' opportunity." In a single week, flares from V404 Cygni generated more than 70 "triggers" of the Gamma-ray Burst Monitor (GBM) aboard Fermi. This is more than five times the number of triggers seen from all objects in the sky in a typical week. The GBM triggers when it detects a gamma-ray flare, then it sends numerous emails containing increasingly refined information about the event to scientists on duty. Every time the GBM recovered from one trigger, V404 Cygni set it off again, resulting in a torrent of emails. The event prompted David Yu, a GBM scientist at the Max Planck Institute of Extraterrestrial Physics in Garching, Germany, to comment on social media: "Achievement Unlocked: Mailbox spammed by a blackhole." The universe can be a very sticky place, but just how sticky is a matter of debate. That is because for decades cosmologists have had trouble reconciling the classic notion of viscosity based on the laws of thermodynamics with Einstein's general theory of relativity. However, a team from Vanderbilt University has come up with a fundamentally new mathematical formulation of the problem that appears to bridge this long-standing gap. This is a timeline of life of the universe that ends in a Big Rip. The new math has some significant implications for the ultimate fate of the universe. 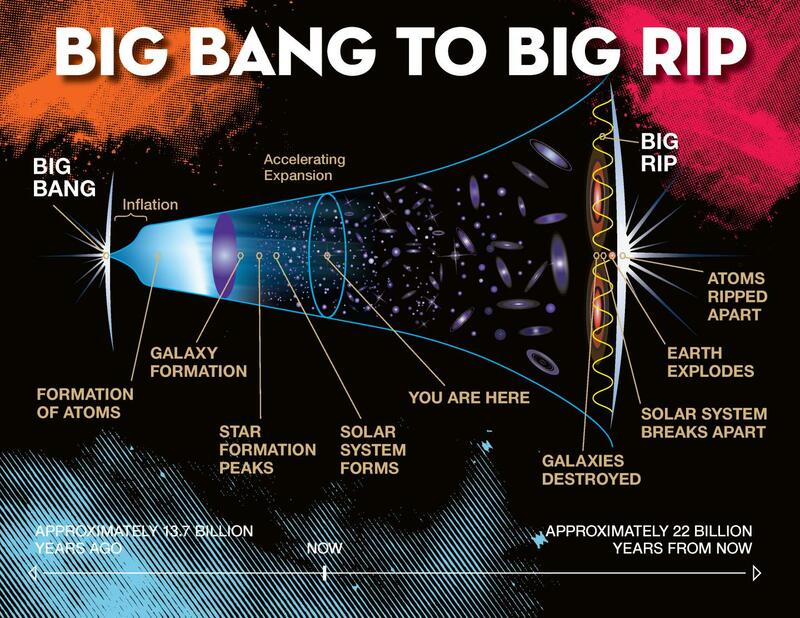 It tends to favor one of the more radical scenarios that cosmologists have come up with known as the "Big Rip." It may also shed new light on the basic nature of dark energy. The new approach was developed by Assistant Professor of Mathematics Marcelo Disconzi in collaboration with physics professors Thomas Kephart and Robert Scherrer and is described in a paper published earlier this year in the journal Physical Review D.
"Marcelo has come up with a simpler and more elegant formulation that is mathematically sound and obeys all the applicable physical laws," said Scherrer. The type of viscosity that has cosmological relevance is different from the familiar "ketchup" form of viscosity, which is called shear viscosity and is a measure of a fluid's resistance to flowing through small openings like the neck of a ketchup bottle. Instead, cosmological viscosity is a form of bulk viscosity, which is the measure of a fluid's resistance to expansion or contraction. The reason we don't often deal with bulk viscosity in everyday life is because most liquids we encounter cannot be compressed or expanded very much. Disconzi began by tackling the problem of relativistic fluids. Astronomical objects that produce this phenomenon include supernovae (exploding stars) and neutron stars (stars that have been crushed down to the size of planets). Scientists have had considerable success modeling what happens when ideal fluids - those with no viscosity - are boosted to near-light speeds. But almost all fluids are viscous in nature and, despite decades of effort, no one has managed to come up with a generally accepted way to handle viscous fluids traveling at relativistic velocities. In the past, the models formulated to predict what happens when these more realistic fluids are accelerated to a fraction of the speed of light have been plagued with inconsistencies: the most glaring of which has been predicting certain conditions where these fluids could travel faster than the speed of light. "This is disastrously wrong," said Disconzi, "since it is well-proven experimentally that nothing can travel faster than the speed of light." These problems inspired the mathematician to re-formulate the equations of relativistic fluid dynamics in a way that does not exhibit the flaw of allowing faster-than-light speeds. He based his approach on one that was advanced in the 1950s by French mathematician André Lichnerowicz. Next, Disconzi teamed up with Kephart and Scherrer to apply his equations to broader cosmological theory. This produced a number of interesting results, including some potential new insights into the mysterious nature of dark energy. In the 1990s, the physics community was shocked when astronomical measurements showed that the universe is expanding at an ever-accelerating rate. To explain this unpredicted acceleration, they were forced to hypothesize the existence of an unknown form of repulsive energy that is spread throughout the universe. Because they knew so little about it, they labeled it "dark energy." Most dark energy theories to date have not taken cosmic viscosity into account, despite the fact that it has a repulsive effect strikingly similar to that of dark energy. "It is possible, but not very likely, that viscosity could account for all the acceleration that has been attributed to dark energy," said Disconzi. "It is more likely that a significant fraction of the acceleration could be due to this more prosaic cause. As a result, viscosity may act as an important constraint on the properties of dark energy." Another interesting result involves the ultimate fate of the universe. Since the discovery of the universe's run-away expansion, cosmologists have come up with a number of dramatic scenarios of what it could mean for the future. One scenario, dubbed the "Big Freeze," predicts that after 100 trillion years or so the universe will have grown so vast that the supplies of gas will become too thin for stars to form. As a result, existing stars will gradually burn out, leaving only black holes which, in turn, slowly evaporate away as space itself gets colder and colder. An even more radical scenario is the "Big Rip." It is predicated on a type of "phantom" dark energy that gets stronger over time. In this case, the expansion rate of the universe becomes so great that in 22 billion years or so material objects begin to fall apart and individual atoms disassemble themselves into unbound elementary particles and radiation. The key value involved in this scenario is the ratio between dark energy's pressure and density, what is called its equation of state parameter. If this value drops below -1 then the universe will eventually be pulled apart. Cosmologists have called this the "phantom barrier." In previous models with viscosity the universe could not evolve beyond this limit. In the Desconzi-Kephart-Scherrer formulation, however, this barrier does not exist. Instead, it provides a natural way for the equation of state parameter to fall below -1. "In previous models with viscosity the Big Rip was not possible," said Scherrer. "In this new model, viscosity actually drives the universe toward this extreme end state." According to the scientists, the results of their pen-and-paper analyses of this new formulation for relativistic viscosity are quite promising but a much deeper analysis must be carried out to determine its viability. The only way to do this is to use powerful computers to analyze the complex equations numerically. In this fashion the scientists can make predictions that can be compared with experiment and observation. A sprite as captured in this pseudo-color, composite photo recorded from an aircraft by a high-speed, high-sensitivity camera. These spectacular phenomena, called sprites, are fireworks-like electrical discharges, sometimes preceded by halos of light, in earth's upper atmosphere. It has been long thought that atmospheric gravity waves play an important role in the initiation of sprites but no previous studies, until this team's recent findings, provided convincing arguments to support that idea. In this high-speed video captured from an airplane of the luminous phenomenon known as a sprite, a halo first appears and persists for a short while, and sprite elements are initiated from the bottom of the halo in an explosive manner and form a spectacular fireworks-like display. Researchers led by Florida Institute of Technology's Ningyu Liu have now provided a clearer understanding of the atmospheric mechanisms that lead to sprite formation. 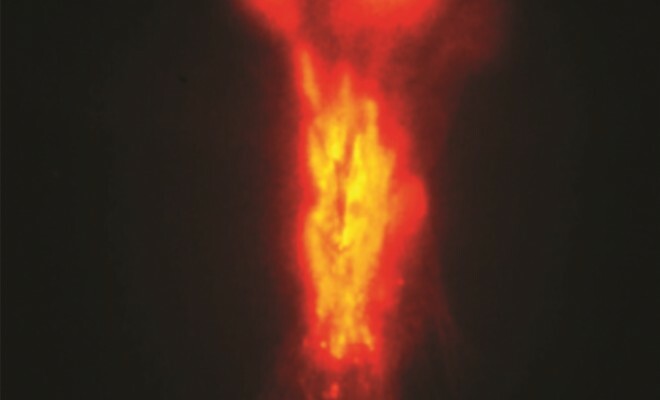 The research, published in the June 29 issue of Nature Communications, includes comprehensive computer-simulation results from a novel sprite initiation model and dramatic images of a sprite event, and provides a clearer understanding of the atmospheric mechanisms that lead to sprite formation. Understanding the conditions of sprite formation is important, in part, because they can interfere with or disrupt long-range communication signals by changing the electrical properties of the lower ionosphere. Predicted by Nobel laureate C. T. R. Wilson in 1924 but not discovered until 1989, sprites are triggered by intense cloud-to-ground lightning strokes. They typically last a few to tens of milliseconds; they are bright enough to be seen with dark-adapted naked eyes at night; and only the most powerful lightning strokes can cause them. The study, conducted by Liu, a Florida Tech professor of physics and space sciences, and collaborators Joseph Dwyer, a former professor at Florida Tech now at University of New Hampshire, Hans Stenbaek-Nielsen from University of Alaska Fairbanks, and Matthew McHarg from the United States Air Force Academy, investigated how sprites are initiated. According to Liu, the perturbations in the upper atmosphere created by atmospheric gravity waves can grow in the electric field produced by lightning and eventually lead to sprites. "Perturbations with small size and large amplitude are best for initiating sprites," Liu said. "If the size of the perturbation is too large, sprite initiation is impossible; if the magnitude of the perturbation is small, it requires a relatively long time for sprites to be initiated." To validate their model, the team analyzed a sprite event captured simultaneously by high-speed, high-sensitivity cameras on two aircraft during an observation mission sponsored by the Japanese broadcasting corporation NHK. The high-speed images show that a relatively long-lasting sprite halo preceded the fast initiation of sprite elements, exactly as predicted by the model. Hamid Rassoul, an atmospheric physicist and the dean of Florida Tech's College of Science, said the findings will be critical to future researchers. "They will allow scientists to study not only sprites but also the mesospheric perturbations, which are difficult, if not impossible, to observe," he said. Liu added, "Our findings also suggest that small, dim glows in the upper atmosphere may be frequently caused by intense lightning but elude the detection. There may be many interesting phenomena waiting for discovery with more sensitive imaging systems." More on the study can be found at the Nature Communications website http://www.nature.com/ncomms/2015/150629/ncomms8540/full/ncomms8540.html. Do Rats 'Dream' Paths to a Brighter Future? When rats rest, their brains simulate journeys to a desired future such as a tasty treat, finds new University College London (UCL) research funded by the Wellcome Trust and Royal Society. The researchers monitored brain activity in rats, first as the animals viewed food in a location they could not reach, then as they rested in a separate chamber, and finally as they were allowed to walk to the food. The activity of specialised brain cells involved in navigation suggested that during the rest the rats simulated walking to and from food that they had been unable to reach. 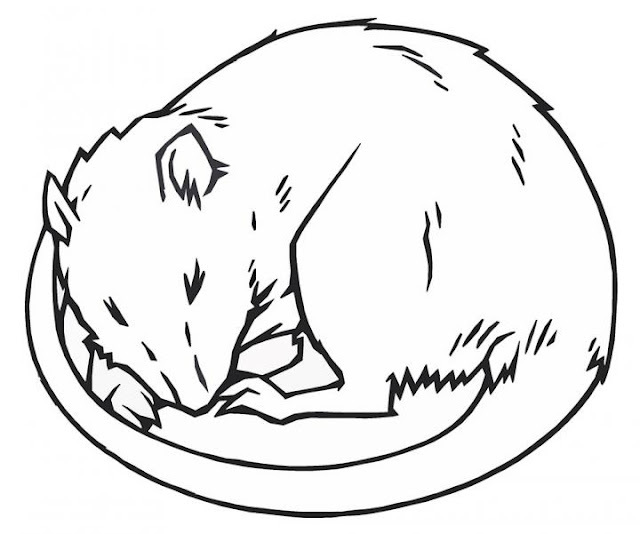 An illustration of a sleeping rat. This was part of a paper published in the open access eLife journal suggesting that rats 'dream' paths to a brighter future. The research at UCL (University College London) found that when rats rest, their brains simulate journeys to a desired future such as a tasty treat. The study, published in the open access journal eLife, could help to explain why some people with damage to a part of the brain called the hippocampus are unable to imagine the future. "During exploration, mammals rapidly form a map of the environment in their hippocampus," says senior author Dr Hugo Spiers (UCL Experimental Psychology). "During sleep or rest, the hippocampus replays journeys through this map which may help strengthen the memory. It has been speculated that such replay might form the content of dreams. Whether or not rats experience this brain activity as dreams is still unclear, as we would need to ask them to be sure! Our new results show that during rest the hippocampus also constructs fragments of a future yet to happen. Because the rat and human hippocampus are similar, this may explain why patients with damage to their hippocampus struggle to imagine future events." In the experiment, animals were individually placed on a straight track with a T-junction ahead. Access to the junction as well as the left and right hand arms beyond it was prevented by a transparent barrier. One of the arms had food at the end, the other side was empty. After observing the food the rats were put in a sleep chamber for an hour. Finally after the barrier was removed, the animals were returned to the track and allowed to run across the junction and on to the arms. During the rest period, the data showed that place cells that would later provide an internal map of the food arm were active. Cells representing the empty arm were not activated in this way. This indicates that the brain was simulating or preparing future paths leading to a desired goal. "What's really interesting is that the hippocampus is normally thought of as being important for memory, with place cells storing details about locations you've visited," explains co-lead author Dr Freyja Ólafsdóttir (UCL Biosciences). "What's surprising here is that we see the hippocampus planning for the future, actually rehearsing totally novel journeys that the animals need to take in order to reach the food." The results suggest that the hippocampus plans routes that have not yet happened as well as recording those that have already happened, but only when there is a motivational cue such as food. This may also imply the ability to imagine future events is not a uniquely human ability. "What we don't know at the moment is what these neural simulations are actually for," says co-lead author Dr Caswell Barry (UCL Biosciences). "It seems possible this process is a way of evaluating the available options to determine which is the most likely to end in reward, thinking it through if you like. We don't know that for sure though and something we'd like to do in the future is try to establish a link between this apparent planning and what the animals do next." 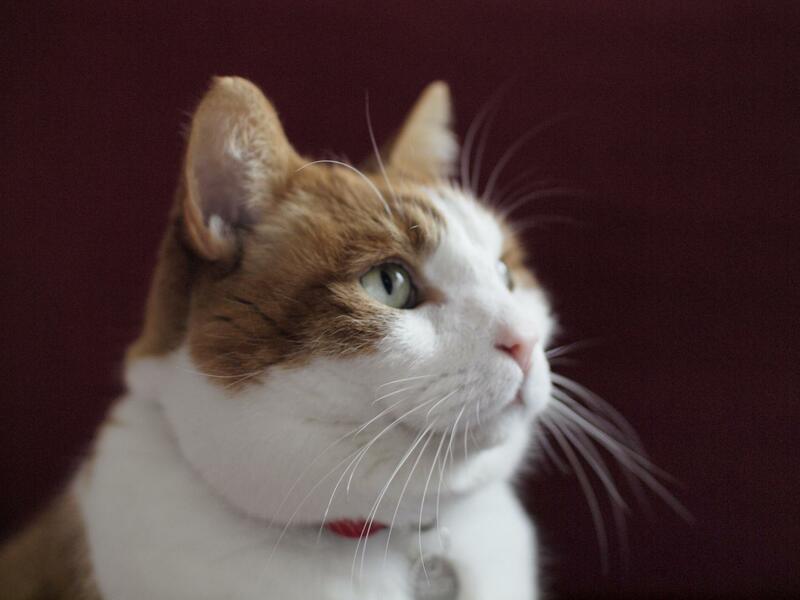 Study finds pet owners reluctant to face up to their cats' kill count. Cats are increasingly earning themselves a reputation as wildlife killers with estimates of animals killed every year by domestic cats in the UK numbering into the millions. This new study on the attitudes of cat owners suggests that proposals to keep cats indoors in order to preserve wildlife would not be well received. A study finds pet owners are reluctant to face up to their cats' kill count. The researchers studied cats from two UK villages, Mawnan Smith in Cornwall and Thornhill near Stirling. They found that although cat owners were broadly aware of whether their cat was predatory or not, those with a predatory cat had little idea of how many prey items it typically caught. Regardless of the amount of prey returned by their cats, the majority of cat owners did not agree that cats are harmful to wildlife and were against suggestions that they should keep their cat inside as a control measure. They were however willing to consider neutering which is generally associated with cat welfare. The results, which are published in Ecology and Evolution, indicate that management options to control cat predation are likely to be unsuccessful unless they focus on cat welfare. Dr Jenni McDonald from the Centre for Ecology and Conservation at the University of Exeter's Penryn Campus in Cornwall said: "Our study shows that cat owners do not accept that cats are a threat to wildlife, and oppose management strategies with the exception of neutering. There is a clear need to directly address the perceptions and opinions of cat owners. "If we are to successfully reduce the number of wildlife deaths caused by domestic cats, the study suggests that we should use cat welfare as a method of encouraging cat owners to get involved." Co-author Professor Matthew Evans, Professor of Ecology at Queen Mary University of London, said: "In this paper we examined how aware cat owners were of the predatory behaviour of their pet. Owners proved to be remarkably unaware of the predatory behaviour of their cat, they also did not agree with any measures that might limit the impact that cats have on local wildlife. This study illustrates how difficult it would be to change the behaviour of cat owners if they are both unaware of how many animals are killed by their pet and resistant to control measures. This presents conservationists who might be attempting to reduce cat predation with serious difficulties, as owners disassociate themselves from any conservation impacts of their cat and take the view that cat predation is a natural part of the ecosystem." A total of 58 households, with 86 cats, took part in the study. Owners' views regarding their cats' predatory behaviour was assessed by comparing predictions of the number of prey their cat returns with the actual numbers bought home. A questionnaire was given to 45 owners at Mawnan Smith to determine whether the predatory behaviour of cats influences the attitudes of their owners. In the UK, 23% of households share a population of over ten million domestic cats. Previous studies have shown that although the majority of cats only return a small amount of prey, one or two items per month, it is the cumulative effect of high densities of cats that is likely to have an overall negative effect on the environment. Citation: Reconciling actual and perceived rates of predation by domestic cats by Jennifer L. McDonald, Mairead Maclean, Matthew R. Evans and Dave J. Hodgson is published in Ecology and Evolution. Planets tend to cool as they get older, but Saturn is hotter than astrophysicists say it should be without some additional energy source. 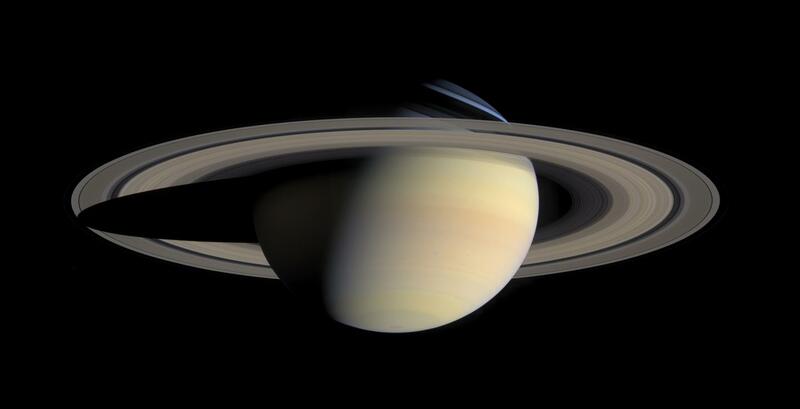 The unexplained heat has caused a two-billion-year discrepancy for computer models estimating Saturn's age. 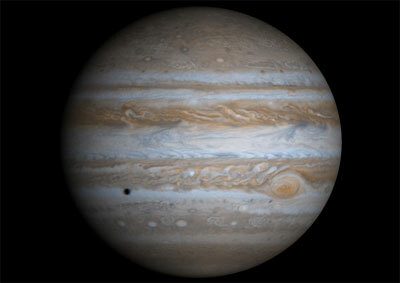 "Models that correctly predict Jupiter to be 4.5 billion years old find Saturn to be only 2.5 billion years old," says Thomas Mattsson, manager of Sandia's high-energy-density physics theory group. Experiments at the Z machine at Sandia National Laboratories have provided data that may explain why Saturn is 2 billion years younger than Jupiter in some simulations. Experiments at Sandia's Z machine may have helped solve that problem when they verified an 80-year-old proposition that molecular hydrogen, normally an insulator, becomes metallic if squeezed by enough pressure. Physicists Eugene Wigner and Hilliard Huntington predicted in 1935 that a pressured lattice of hydrogen molecules would break up into individual hydrogen atoms, releasing free-floating electrons that could carry a current. "That long-ago prediction would explain Saturn's temperature because, when hydrogen metallizes and mixes with helium in a dense liquid, it can release helium rain," said Sandia researcher Mike Desjarlais. Helium rain is an energy source that can alter the evolution of a planet. "Essentially, helium rain would keep Saturn warmer than calculations of planetary age alone would predict," said Marcus Knudson. Knudson and Desjarlais are the lead authors of a June 26 Science article, "Direct observation of an abrupt insulator-to-metal transition in dense liquid deuterium." This proposed density-driven hydrogen transition had never been observed experimentally until Sandia's recent experiments. The tests ran on Sandia's Z machine, the world's most powerful pulsed-power machine, which sends a huge but precisely tuned sub-microsecond pulse of electricity at a target. The correspondingly strong magnetic field surrounding the pulse was used to shocklessly squeeze deuterium -- a heavier variant of hydrogen -- at relatively low temperatures. Previous experiments elsewhere used gas guns to shock the gas. This increased its pressure but at the same time raised its temperature beyond the range of interest for the density-driven phase transition. "We started at 20 degrees Kelvin, where hydrogen is a liquid, and sent a few hundred kilobar shock -- a tiny flyer plate pushed by Z's magnetic field into the hydrogen -- to warm the liquid," said Knudson. "Then we used Z's magnetic field to further compress the hydrogen shocklessly, which kept it right above the liquid-solid line at about 1,000 degrees K."
Said Desjarlais, "When the liquid was compressed to over 12 times its starting density, we saw the signs that it became atomic rather than molecular. The transition, at three megabars of pressure, gives theorists a solid figure to use in their calculations and helps identify the best theoretical framework for modeling these extreme conditions." The results need to be plugged into astrophysical models to see whether the now-confirmed transition to atomic hydrogen significantly decreases the age gap between the two huge planets. "The Sandia work shows that dense hydrogen can be metallic, which in turn changes the coexistence of hydrogen and helium in the planet," says Mattsson. "The mechanism of helium rain that has been proposed is therefore very plausible, given our results, but the scientific discussion will continue over the next few years in establishing a new consensus." Interestingly, the determination that a metallic phase was reached was made optically. "There's too much electrical noise in Z to make an electrical test, though we plan to directly measure current down the road," Knudson said. Optical tests rely on the transition from zero reflectivity (insulators) to the reflectivity achieved by metals. "The only way you get reflectivity is when a material is metallic," Knudson said. Reflectivity was tested across the visible spectrum -- from 450 to 750 nanometers. "The experiment itself produced light," he said. "We collected it, put it through a spectrometer to disperse it and passed it into a camera to observe it." When the hydrogen insulator reached enough pressure to become metallized, the researchers observed 45 percent reflectivity, an excellent agreement with theoretical calculations, said Desjarlais. "This is a very nice merging of theory and experiment," he said. "We threw all our computational tools -- which are significant -- at providing verification and interpretation of the complex experimental observations at Z." The work was done in collaboration with professor Ronald Redmer's research group at University of Rostock in Germany and is a part of the Z Fundamental Science Program at Sandia. The multidisciplinary team included researchers with expertise in innovative experimental design, diagnostics and pulse-shaping capabilities, matched with theoretical analysis using methods based on quantum mechanics. Other authors besides Knudson, Desjarlais and Mattsson include Redmer and Andreas Becker at University of Rostock and Ray Lemke, Kyle Cochrane, Mark Savage, and Dave Bliss at Sandia. The Z machine is a National High Energy Density Science Facility supported by the National Nuclear Security Administration. 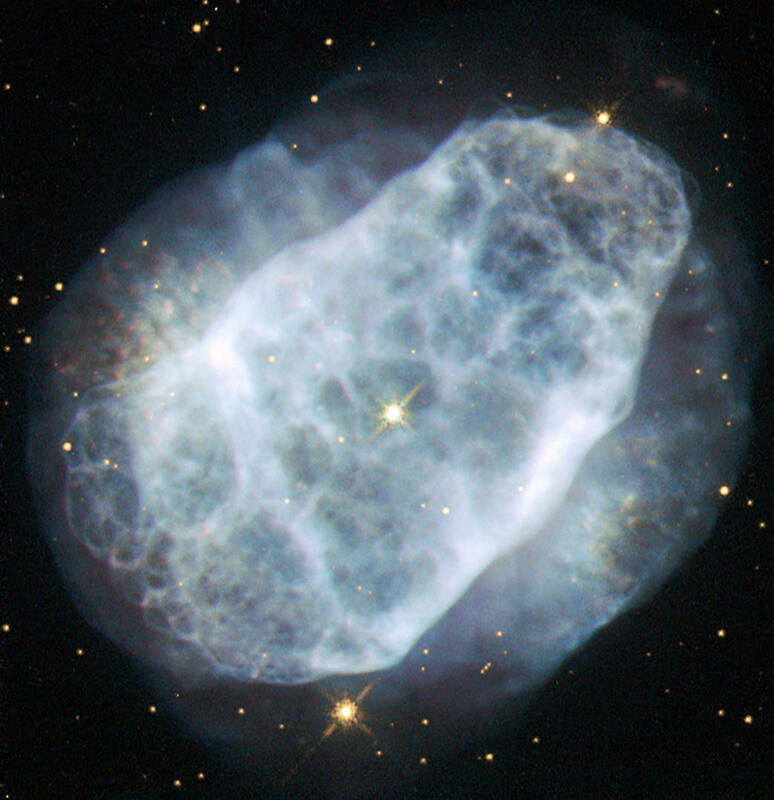 This NASA/ESA Hubble Space Telescope image shows a planetary nebula named NGC 6153, located about 4,000 light-years away in the southern constellation of Scorpius (The Scorpion). The faint blue haze across the frame shows what remains of a star like the sun after it has depleted most of its fuel. When this happens, the outer layers of the star are ejected, and get excited and ionized by the energetic ultraviolet light emitted by the bright hot core of the star, forming the nebula. Measurements show that NGC 6153 contains large amounts of neon, argon, oxygen, carbon and chlorine — up to three times more than can be found in the solar system. The nebula contains a whopping five times more nitrogen than our sun! Although it may be that the star developed higher levels of these elements as it grew and evolved, it is more likely that the star originally formed from a cloud of material that already contained a lot more of these elements. "Earth's rotation is gradually slowing down a bit, so leap seconds are a way to account for that," said Daniel MacMillan of NASA's Goddard Space Flight Center in Greenbelt, Md. Originally developed to study distant astronomical objects called quasars, the technique called Very Long Baseline Interferometry provides information about the relative locations of observing stations and about Earth’s rotation and orientation in space. Strictly speaking, a day lasts 86,400 seconds. That is the case, according to the time standard that people use in their daily lives -- Coordinated Universal Time, or UTC. UTC is "atomic time" -- the duration of one second is based on extremely predictable electromagnetic transitions in atoms of cesium. These transitions are so reliable that the cesium clock is accurate to one second in 1,400,000 years. However, the mean solar day -- the average length of a day, based on how long it takes Earth to rotate -- is about 86,400.002 seconds long. That's because Earth's rotation is gradually slowing down a bit, due to a kind of braking force caused by the gravitational tug of war between Earth, the moon and the sun. Scientists estimate that the mean solar day hasn't been 86,400 seconds long since the year 1820 or so. This difference of 2 milliseconds, or two thousandths of a second -- far less than the blink of an eye -- hardly seems noticeable at first. But if this small discrepancy were repeated every day for an entire year, it would add up to almost a second. In reality, that's not quite what happens. Although Earth's rotation is slowing down on average, the length of each individual day varies in an unpredictable way. The length of day is influenced by many factors, mainly the atmosphere over periods less than a year. Our seasonal and daily weather variations can affect the length of day by a few milliseconds over a year. Other contributors to this variation include dynamics of the Earth's inner core (over long time periods), variations in the atmosphere and oceans, groundwater, and ice storage (over time periods of months to decades), and oceanic and atmospheric tides. Atmospheric variations due to El Niño can cause Earth's rotation to slow down, increasing the length of day by as much as 1 millisecond, or a thousandth of a second. Scientists monitor how long it takes Earth to complete a full rotation using an extremely precise technique called Very Long Baseline Interferometry (VLBI). These measurements are conducted by a worldwide network of stations, with Goddard providing essential coordination of VLBI, as well as analyzing and archiving the data collected. The time standard called Universal Time 1, or UT1, is based on VLBI measurements of Earth's rotation. UT1 isn't as uniform as the cesium clock, so UT1 and UTC tend to drift apart. Leap seconds are added, when needed, to keep the two time standards within 0.9 seconds of each other. The decision to add leap seconds is made by a unit within the International Earth Rotation and Reference Systems Service. Typically, a leap second is inserted either on June 30 or December 31. Normally, the clock would move from 23:59:59 to 00:00:00 the next day. But with the leap second on June 30, UTC will move from 23:59:59 to 23:59:60, and then to 00:00:00 on July 1. In practice, many systems are instead turned off for one second. Previous leap seconds have created challenges for some computer systems and generated some calls to abandon them altogether. One reason is that the need to add a leap second cannot be anticipated far in advance. "In the short term, leap seconds are not as predictable as everyone would like," said Chopo Ma, a geophysicist at Goddard and a member of the directing board of the International Earth Rotation and Reference Systems Service. "The modeling of the Earth predicts that more and more leap seconds will be called for in the long-term, but we can't say that one will be needed every year." Scientists don't know exactly why fewer leap seconds have been needed lately. Sometimes, sudden geological events, such as earthquakes and volcanic eruptions, can affect Earth's rotation in the short-term, but the big picture is more complex. VLBI tracks these short- and long-term variations by using global networks of stations to observe astronomical objects called quasars. The quasars serve as reference points that are essentially motionless because they are located billions of light years from Earth. Because the observing stations are spread out across the globe, the signal from a quasar will take longer to reach some stations than others. Scientists can use the small differences in arrival time to determine detailed information about the exact positions of the observing stations, Earth's rotation rate, and our planet's orientation in space. Current VLBI measurements are accurate to at least 3 microseconds, or 3 millionths of a second. A new system is being developed by NASA's Space Geodesy Project in coordination with international partners. Through advances in hardware, the participation of more stations, and a different distribution of stations around the globe, future VLBI UT1 measurements are expected to have a precision better than 0.5 microseconds, or 0.5 millionths of a second. "The next-generation system is designed to meet the needs of the most demanding scientific applications now and in the near future," says Goddard's Stephen Merkowitz, the Space Geodesy Project manager. NASA manages many activities of the International VLBI Service for Geodesy and Astrometry including day-to-day and long-term operations, coordination and performance of the global network of VLBI antennas, and coordination of data analysis. NASA also directly supports the operation of six global VLBI stations. Proposals have been made to abolish the leap second. No decision about this is expected until late 2015 at the earliest, by the International Telecommunication Union, a specialized agency of the United Nations that addresses issues in information and communication technologies. For more information about NASA's Space Geodesy Project, including VLBI, visit: http://space-geodesy.nasa.gov/. 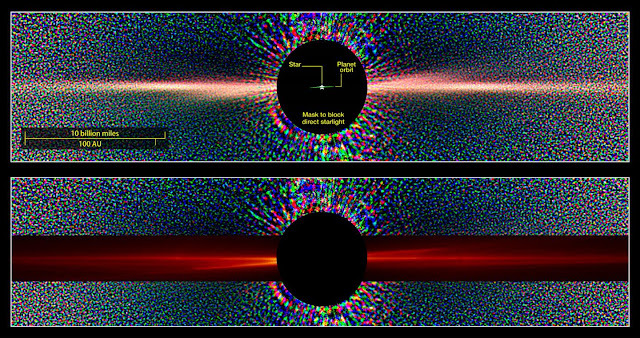 A new NASA supercomputer simulation of the planet and debris disk around the nearby star Beta Pictoris reveals that the planet's motion drives spiral waves throughout the disk, a phenomenon that causes collisions among the orbiting debris. Patterns in the collisions and the resulting dust appear to account for many observed features that previous research has been unable to fully explain. "We essentially created a virtual Beta Pictoris in the computer and watched it evolve over millions of years," said Erika Nesvold, an astrophysicist at the University of Maryland, Baltimore County, who co-developed the simulation. "This is the first full 3-D model of a debris disk where we can watch the development of asymmetric features formed by planets, like warps and eccentric rings, and also track collisions among the particles at the same time." Erika Nesvold and Marc Kuchner discuss how their new supercomputer simulation helps astronomers understand Beta Pictoris. In 1984, Beta Pictoris became the second star known to be surrounded by a bright disk of dust and debris. Located only 63 light-years away, Beta Pictoris is an estimated 21 million years old, or less than 1 percent the age of our solar system. It offers astronomers a front-row seat to the evolution of a young planetary system and it remains one of the closest, youngest and best-studied examples today. The disk, which we see edge on, contains rock and ice fragments ranging in size from objects larger than houses to grains as small as smoke particles. It's a younger version of the Kuiper belt at the fringes of our own planetary system. Nesvold and her colleague Marc Kuchner, an astrophysicist at NASA's Goddard Space Flight Center in Greenbelt, Md., presented the findings Thursday during the "In the Spirit of Lyot 2015" conference in Montreal, which focuses on the direct detection of planets and disks around distant stars. A paper describing the research has been submitted to The Astrophysical Journal. In 2009, astronomers confirmed the existence of Beta Pictoris b, a planet with an estimated mass of about nine times Jupiter's, in the debris disk around Beta Pictoris. Traveling along a tilted and slightly elongated 20-year orbit, the planet stays about as far away from its star as Saturn does from our sun. "Our simulation suggests many of these features can be readily explained by a pair of colliding spiral waves excited in the disk by the motion and gravity of Beta Pictoris b," Kuchner said. "Much like someone doing a cannonball in a swimming pool, the planet drove huge changes in the debris disk once it reached its present orbit." Keeping tabs on thousands of fragmenting particles over millions of years is a computationally difficult task. Existing models either weren't stable over a sufficiently long time or contained approximations that could mask some of the structure Nesvold and Kuchner were looking for. Working with Margaret Pan and Hanno Rein, both now at the University of Toronto, they developed a method where each particle in the simulation represents a cluster of bodies with a range of sizes and similar motions. By tracking how these "superparticles" interact, they could see how collisions among trillions of fragments produce dust and, combined with other forces in the disk, shape it into the kinds of patterns seen by telescopes. The technique, called the Superparticle-Method Algorithm for Collisions in Kuiper belts (SMACK), also greatly reduces the time required to run such a complex computation. The planet's orbit also is slightly eccentric, which means its distance from the star varies a little every orbit. This motion stirs up the debris and drives a second spiral wave across the face of the disk. This wave increases collisions in the inner regions of the disk, which removes larger fragments by grinding them away. 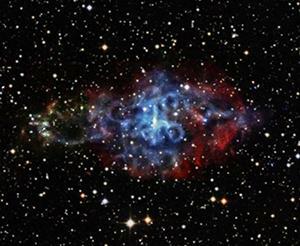 In the real disk, astronomers report a similar clearing out of large debris close to the star. "One of the nagging questions about Beta Pictoris is how the planet ended up in such an odd orbit," Nesvold explained. "Our simulation suggests it arrived there about 10 million years ago, possibly after interacting with other planets orbiting the star that we haven't detected yet." By studying iron extracted from cores drilled in rocks similar to these in Karijini National Park, Western Australia, UW-Madison researchers determined that half of the iron atoms had originated in shallow oceans after being processed by microbes 2.5 billion years ago. That's the upshot of a study published this week in the Proceedings of the National Academy of Sciences (PNAS). The findings have meaning for fields as diverse as mining and the search for life in space. Bursts of light less than one-trillionth of a second long vaporized thin sections of the sample without heating the sample itself. "It's like taking an ice cream scoop and quickly pulling out material before it gets heated," Johnson explains. "Heating with traditional lasers gave spurious results." It took three years to perfect the working of the laser and associated mass spectrometry instruments, Li says. 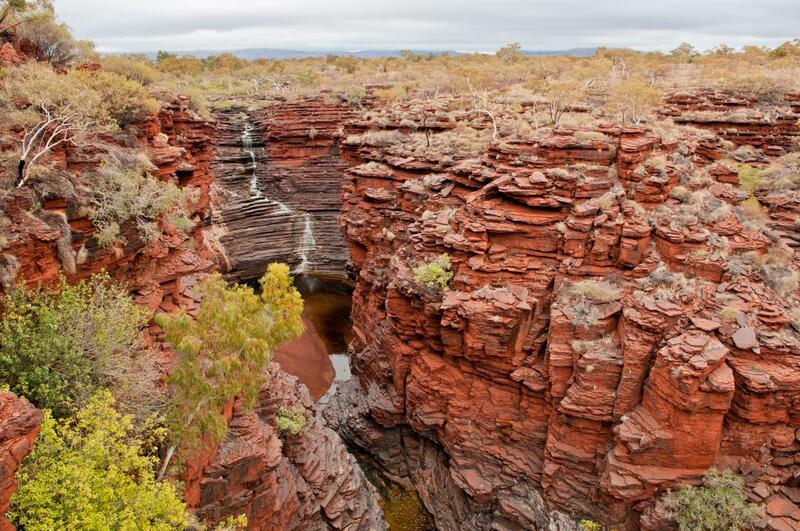 Previous probes of the source of banded iron had focused on iron isotopes. "There has been debate about what the iron isotopes were telling us about the source," Li says. "Adding neodymium changed that picture and gave us an independent measure of the amount coming from shallow continental waters that carried an isotopic signature of life." Biologists say this process "is really deep in the tree of life, but we've had little evidence from the rock record until now," Johnson says. "These ancient microbes were respiring iron just like we respire oxygen. It's a hard thing to wrap your head around, I admit." The current study is important in several ways, Johnson says. "If you are an exploration geologist, you want to know the source of the minerals so you know where to explore." 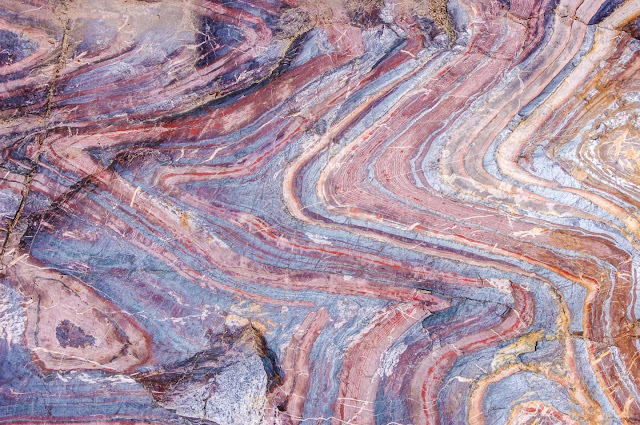 The research also clarifies the evolution of our planet -- and of life itself -- during the "iron-rich" era 2.5 billion years ago. "What vestiges of the iron-rich world remain in our metabolism?" Johnson asks. "It's no accident that iron is an important part of life, that early biological molecules may have been iron-based." The study reinforces the importance of microbes in geology. "This represents a huge change," Johnson says. "In my introductory geochemistry textbook from 1980, there is no mention of biology, and so every diagram showing what minerals are stable at what conditions on the surface of the Earth is absolutely wrong." Research results like these affect how classes are taught, Johnson says. "If I only taught the same thing, I would be teaching things that are absolutely wrong. If you ever wonder why we combine teaching and research at this university, geomicrobiology gives you the answer. It has completely turned geoscience on its ear." New work from Carnegie's Alan Boss offers a potential solution to a longstanding problem in the prevailing theory of how rocky planets formed in our own Solar System, as well as in others. The snag he's untangling: how dust grains in the matter orbiting a young protostar avoid getting dragged into the star before they accumulate into bodies large enough that their own gravity allows them to rapidly attract enough material to grow into planets. The study is published by The Astrophysical Journal. In the early stages of their formation, stars are surrounded by rotating disks of gas and dust. The dust grains in the disk collide and aggregate to form pebbles, which grow into boulders, and so on increasing in size through planetesimals, planetary embryos, and finally rocky terrestrial planets. But there are some difficult outstanding questions raised by this theory. One of these is that the pressure gradient of the gas in the disk would create a headwind that would spiral the pebbles and boulders inward toward the young protostar, where they would be destroyed. The problem is most acute in bodies that are between 1 and 10 meters in radius, because they would be most susceptible to the gas drag. If too many particles in this size range were lost, there wouldn't be enough remaining to collide with each other and accumulate into planetesimals and, eventually, planets. Observations of young stars that are still surrounded by their gas disks demonstrate that those similar in size to our own Sun often undergo periodic explosive bursts, about 100 years in duration, during which the star's luminosity increases. More importantly, these events can be linked to a period of gravitational instability in the disk. Boss's new work shows that such a phase can scatter the at-risk 1- to 10-meter bodies outward away from the developing star, rather than inward toward it. 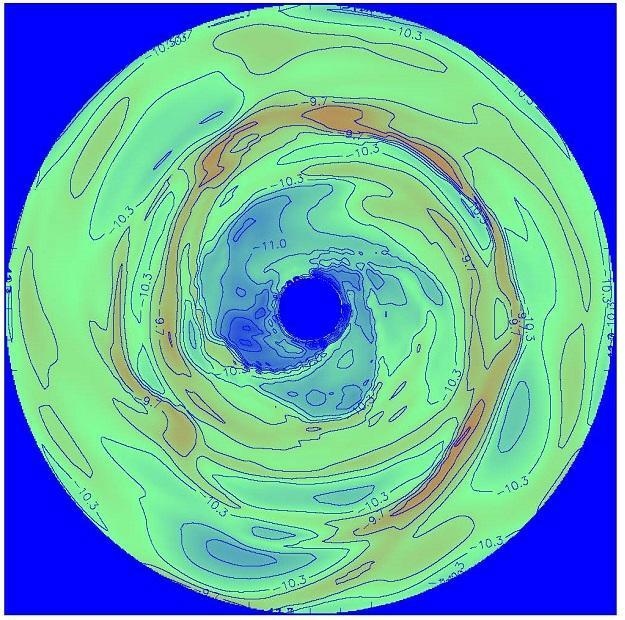 Recent work has shown the presence of spiral arms around young stars, similar to those thought to be involved in the short-term disruptions in the disk. The gravitational forces of these spiral arms could scatter outward the problematic boulder-sized bodies, allowing them to accumulate rapidly to form planetesimals large enough that gas drag is no longer a problem. Boss's modeling techniques hone in on the idea that spiral arms might be able to answer the question of how a developing solar system avoids losing too many larger bodies before the boulders have a chance to grow into something bigger. "This work shows that boulder-sized particles could, indeed, be scattered around the disk by the formation of spiral arms and then avoid getting dragged into the protostar at the center of the developing system," Boss explained. "Once these bodies are in the disk's outer regions, they are safe and able to grow into planetesimals." Smaller particles, however, ranging between 1 and 10 centimeters, are much more likely to be accreted back into the protostar and lost, regardless of spiral arm formation, Boss' models show. "While not every developing protostar may experience this kind of short-term gravitational disruption phase, it is looking increasingly likely that they may be much more important for the early phases of terrestrial planet formation than we thought,"
This work was partially supported by NASA. New observations with ESO’s Very Large Telescope have revealed that the giant elliptical galaxy Messier 87 has swallowed an entire medium-sized galaxy over the last billion years. For the first time a team of astronomers has been able to track the motions of 300 glowing planetary nebulae to find clear evidence of this event and also found evidence of excess light coming from the remains of the totally disrupted victim. The huge halo around giant elliptical galaxy Messier 87 appears on this very deep image. An excess of light in the top-right part of this halo, and the motion of planetary nebulae in the galaxy, are the last remaining signs of a medium-sized galaxy that recently collided with Messier 87.The image also reveals many other galaxies forming the Virgo Cluster, of which Messier 87 is the largest member. In particular, the two galaxies at the top right of the frame are nicknamed "the Eyes". The red and blue dots mark the position of the planetary nebulae whose motion revealed that Messier 87 has recently been struck by another, smaller galaxy, which has now fully merged with it. Those marked in red are moving away from us, and the blue ones toward us with respect to the galaxy as a whole. Rather than try to look at all the stars in Messier 87 — there are literally billions and they are too faint and numerous be studied individually — the team looked at planetary nebulae, the glowing shells around ageing stars . Because these objects shine very brightly in a specific hue of aquamarine green, they can be distinguished from the surrounding stars. Careful observation of the light from the nebulae using a powerful spectrograph can also reveal their motions . This chart shows the position of giant galaxy Messier 87 in the constellation of Virgo (The Virgin). The map shows most of the stars visible to the unaided eye under good conditions. "We are witnessing a single recent accretion event where a medium-sized galaxy fell through the centre of Messier 87, and as a consequence of the enormous gravitational tidal forces, its stars are now scattered over a region that is 100 times larger than the original galaxy!" adds Ortwin Gerhard, head of the dynamics group at the Max-Planck-Institut für extraterrestrische Physik, Garching, Germany, and a co-author of the new study. Planetary nebulae form as Sun-like stars reach the ends of their lives, and they emit a large fraction of their energy in just a few spectral lines, the brightest of which is in the green part of the spectrum. Because of this, they are the only single stars whose motions can be measured at Messier 87's distance of 50 million light-years from Earth. They behave like beacons of green light and as such they tell us where they are and at what velocity they are travelling. Active galactic nuclei are the brightest objects in the universe. They are not lit up permanently, but rather ‘flicker’ extremely slowly. This insight helps ETH researchers better understand the influence these nuclei and black holes have on their host galaxy. 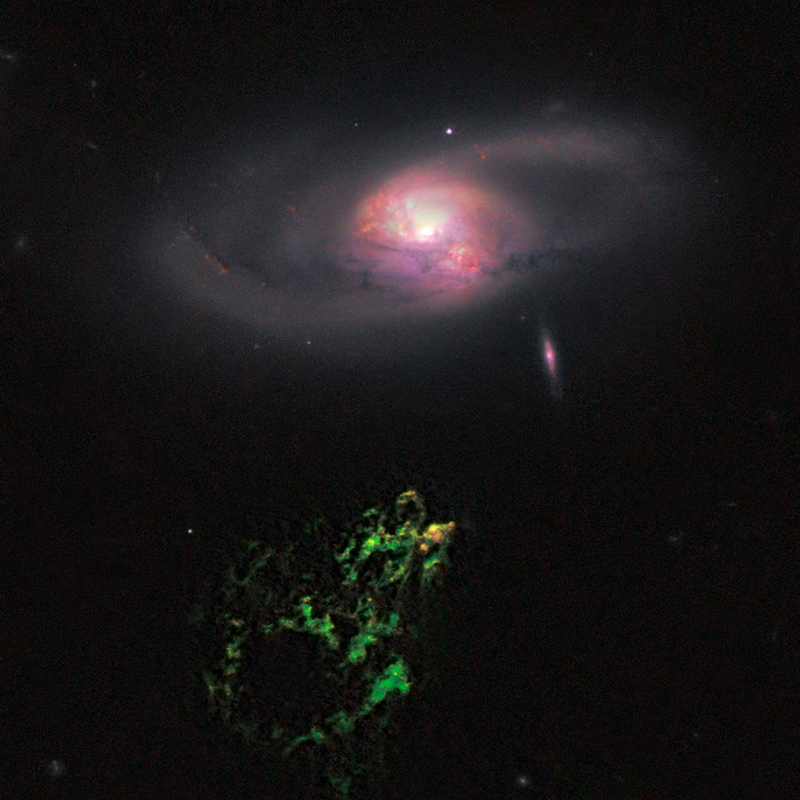 "Hanny's Voorwerp" (green, below) is an astronomical object that has been turned off around 200,000 year ago. Visible in the upper part is the spiral galaxy IC 2497. Supermassive black holes pull in gas with great force from their surroundings. As the gas rotates around the black hole, it becomes progressively hotter through friction and begins to radiate. This is how the brightest objects in the universe, active galactic nuclei (AGN), are formed. They often shine brighter than the hundreds of billions of stars in their galaxy. In the center of our home galaxy, the Milky Way there is also such a black hole that, according to some studies, shone as an AGN a few millions of years ago. ETH Zurich researchers led by Professor Kevin Schawinski of the Institute for Astronomy reveal in their latest study that these AGN are not lit up permanently. Instead, they resemble a flickering lamp. In the current edition of Monthly Notices of the Royal Astronomical Society, ETH astronomers report for the first time that AGN ‘switch on and off’ every couple of hundred thousand years, a finding based on their observational data. AGN emit radiation at all wavelengths from X-rays to radio, so telescopes can capture the X-ray radiation originating from the immediate vicinity of the AGN and also register visible light, albeit with a certain delay. It’s comparable to a gas lamp, which does not light up immediately when switched on. The visible light does not come from the active galactic nucleus, but from the gas that fills the space between the stars in the galaxy. The atoms of the interstellar gas are stimulated to light up in a very specific way by the radiation from the active galactic nucleus. The delay is due to the time required by the light to reach the edge of the galaxy and turn on the ‘galactic gas lamp’. Before this occurs, however, the active galactic nucleus is in an apparent ‘switched-off’ state, at least in terms of the visible light. The active galactic nucleus emits X-ray radiation in this state. ETH researchers discovered in their extensive data collection of observed active galactic nuclei that about 5 percent appeared to be in a ‘switched-off’ state. This means that although they were detected by X-ray telescopes, they did not radiate the visible light typical of a ‘galactic gas lamp’. The scientists concluded that if five percent of all observed AGN do not give off visible light, this means that the apparent switched-off state represents five percent, or a twentieth, of the total duration of an AGN light-dark phase. Put another way, it’s like taking a picture of a person every day of their life. At the end, there would be more pictures of their lengthy adult years than their brief adolescence – and in the same ratio as adulthood lasts much longer than adolescence. Researchers knew from earlier theoretical work that the AGN switched-off state can be compared with adolescence, lasting approximately 10,000 years. This is the amount of time required for light to traverse a typical galaxy. This led to the conclusion that a complete AGN phase – the lifespan of a human in the analogy – lasts 20 times as long on average, or 200,000 years. “This result is crucial in order to understand how an active galactic nucleus influences the surrounding galaxy,” says Schawinski, who led the study. Astrophysicists already knew that active galactic nuclei could accumulate gas over several billion years. However, no one knew whether they amassed enough gas over this period to light up. “Now we know that light emitted by an active galactic nucleus resembles an energy-saving lamp that flickers on and off every 20 milliseconds,” Schawinski explains. In comparison to the hundreds of millions of years in which a galaxy’s nucleus remains active, 200,000 years represents a short period of time. “The 200,000 years should be viewed as an approximation and it is a statistical average,” says Schawinski. That means that the AGN phase may last longer for one galaxy than another, but the length of time should amount to several hundred thousand years for all galaxies. This limitation may shed light on how active galactic nuclei intervene in the development of their host galaxy. For example, it is possible that radiation from an AGN heats up a collapsing gas cloud in which stars are formed. The heating delays or even prevents the collapse of the gas cloud and thus the formation of stars. However, the active galactic nucleus must light up long enough for this to happen. “Thanks to the estimate of the length of an AGN phase, we are one step closer to the answer to this question,” says Schawinski. On its own, dust seems fairly unremarkable. However, by observing the clouds of gas and dust within a galaxy, astronomers can determine important information about the history of star formation and the evolution of galaxies. Using ALMA, astronomers surveyed an array of normal galaxies seen when the Universe was only 1 billion years old. They detected the glow of ionized carbon filling the space between the stars, indicating these galaxies were fully formed but chemically immature, when compared to similar galaxies a few billion years later. The ALMA data for four of these galaxies is show in relation to objects in the COSMOS field taken with the Hubble Space Telescope. Now thanks to the unprecedented sensitivity of the telescope at the Atacama Large Millimeter Array (ALMA) in Chile, a Caltech-led team has been able to observe the dust contents of galaxies as seen just 1 billion years after the Big Bang--a time period known as redshift 5-6. These are the earliest average-sized galaxies to ever be directly observed and characterized in this way. The work is published in the June 25 edition of the journal Nature. Dust in galaxies is created by the elements released during the formation and collapse of stars. Although the most abundant elements in the universe--hydrogen and helium--were created by the Big Bang, stars are responsible for making all of the heavier elements in the universe, such as carbon, oxygen, nitrogen, and iron. And because young, distant galaxies have had less time to make stars, these galaxies should contain less dust. Previous observations had suggested this, but until now nobody could directly measure the dust in these faraway galaxies. "Before we started this study, we knew that stars formed out of these clouds of gas and dust, and we knew that star formation was probably somehow different in the early universe, where dust is likely less common. But the previous information only really hinted that the properties of the gas and the dust in earlier galaxies were different than in galaxies we see around us today. We wanted to find data that showed that," says Peter Capak, a staff scientist at the Infrared Processing and Analysis Center (IPAC) at Caltech and the first author of the study. Armed with the high sensitivity of ALMA, Capak and his colleagues set out to perform a direct analysis of the dust in these very early galaxies. Young, faraway galaxies are often difficult to observe because they appear very dim from Earth. Previous observations of these young galaxies, which formed just 1 billion years after the Big Bang, were made with the Hubble Space Telescope and the W. M. Keck Observatory--both of which detect light in the near-infrared and visible bands of the electromagnetic spectrum. The color of these galaxies at these wavelengths can be used to make inferences about the dust--for example, galaxies that appear bluer in color tend to have less dust, while those that are red have more dust. However, other effects like the age of the stars and our distance from the galaxy can mimic the effects of dust, making it difficult to understand exactly what the color means. The researchers began their observations by first analyzing these early galaxies with the Keck Observatory. Keck confirmed the distance from the galaxies as redshift greater than 5--verifying that the galaxies were at least as young as they previously had been thought to be. The researchers then observed the same galaxies using ALMA to detect light at the longer millimeter and submillimeter wavelengths of light. 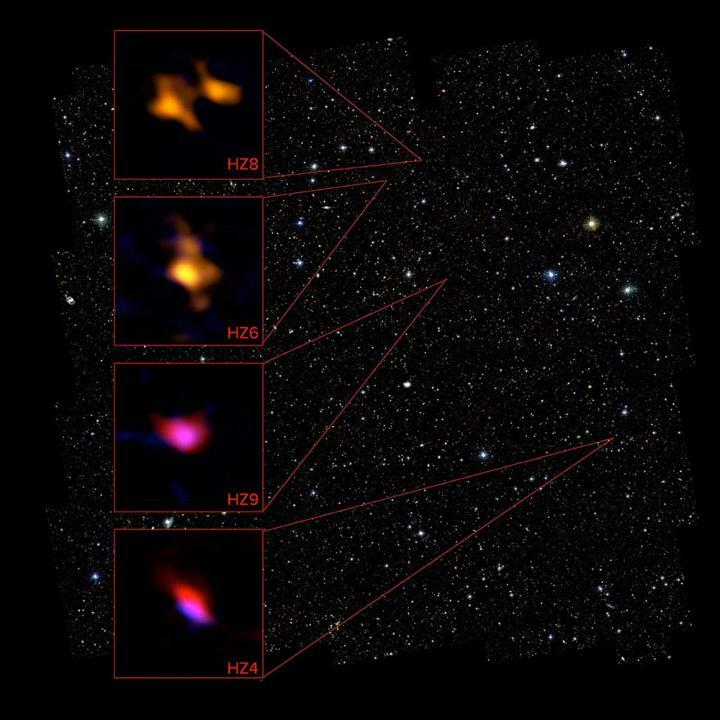 The ALMA readings provided a wealth of information that could not be seen with visible-light telescopes, including details about the dust and gas content of these very early galaxies. Capak and his colleagues were able to use ALMA to--for the first time--directly view the dust and gas clouds of nine average-sized galaxies during this epoch. Specifically, they focused on a feature called the carbon II spectral line, which comes from carbon atoms in the gas around newly formed stars. The carbon line itself traces this gas, while the data collected around the carbon line traces a so-called continuum emission, which provides a measurement of the dust. The researchers knew that the carbon line was bright enough to be seen in mature, dust-filled nearby galaxies, so they reasoned that the line would be even brighter if there was indeed less dust in the young faraway galaxies. Using the carbon line, their results confirmed what had previously been suggested by the data from Hubble and Keck: these older galaxies contained, on average, 12 times less dust than galaxies from 2 billion years later (at a redshift of approximately 4). "In galaxies like our Milky Way or nearby Andromeda, all of the stars form in very dusty environments, so more than half of the light that is observed from young stars is absorbed by the dust," Capak says. "But in these faraway galaxies we observed with ALMA, less than 20 percent of the light is being absorbed. In the local universe, only very young galaxies and very odd ones look like that. So what we're showing is that the normal galaxy at these very high redshifts doesn't look like the normal galaxy today. Clearly there is something different going on." That "something different" gives astronomers like Capak a peek into the lifecycle of galaxies. Galaxies form because gas and dust are present and eventually turn into stars--which then die, creating even more gas and dust, and releasing energy. Because it is impossible to watch this evolution from young galaxy to old galaxy happen in real time on the scale of a human lifespan, the researchers use telescopes like ALMA to take a survey of galaxies at different evolutionary stages. Capak and his colleagues believe that this lack of dust in early galaxies signifies a never-before-seen evolutionary stage for galaxies. "This result is really exciting. It's the first time that we're seeing the gas that the stars are forming out of in the early universe. We are starting to see the transition from just gas to the first generation of galaxies to more mature systems like those around us today. Furthermore, because the carbon line is so bright, we can now easily find even more distant galaxies that formed even longer ago, sooner after the Big Bang," Capak says. Lin Yan, a staff scientist at IPAC and coauthor on the paper, says that their results are also especially important because they represent typical early galaxies. "Galaxies come in different sizes. Earlier observations could only spot the largest or the brightest galaxies, and those tend to be very special--they actually appear very rarely in the population," she says. "Our findings tell you something about a typical galaxy in that early epoch, so they're results can be observed as a whole, not just as special cases." Yan says that their ability to analyze the properties of these and earlier galaxies will only expand with ALMA's newly completed capabilities. During the study, ALMA was operating with only a portion of its antennas, 20 at the time; the capabilities to see and analyze distant galaxies will be further improved now that the array is complete with 66 antennas, Yan adds. "This is just an initial observation, and we've only just started to peek into this really distant universe at redshift of a little over 5. An astronomer's dream is basically to go as far distant as we can. And when it's complete, we should be able to see all the distant galaxies that we've only ever dreamed of seeing," she says. What Happens in Teenagers' Brains? The Battle of Waterloo: Why Does It Matter? What's on the Surface of a Black Hole?